Irada is a film that tries to draw the attention of the audiences to the harsh reality of the disaterous consequences of rapidly growing water pollution in Punjab. The movie features Naseeruddin Shah, Arshad Warsi, Divya Dutta, Sagarika Ghatge, Sharad Kelkar, Nikhil Pandey, Rumana Molla. It has been directed by debutant director Aparnaa Singh and was released in theatres across the globe on 17th Feb 2017. Parabjeet Walia (Naseeruddin Shah), a former army officer, is shattered when his beloved and only daughter, Riya Walia (Rumana Molla) succumbs to cancer. Then a blast blows away the pharmaceutical factory owned by business tycoon Paddy Sharma (Sharad Kelkar) and the cynical NIA officer, Arjun Mishra (Arshad Warsi) is given the task of investigating the case. During his enquiries, Arjun learns about the criminal nexus between the state administration, headed by Chief Minister Ramandeep Braitch (Divya Dutta), and Paddy Sharma, both of whom turn a blind eye to the fact that the latter’s factory dumps considerable amounts of cancer causing industrial waste into the rivers. He also meets Simi (Sagarika Ghatge), a raging journalist trying to find the murderer of her boyfriend (Nikhil Pandey), who was an RTI activist. Despite a great star cast and a pretty powerful storyline, Irada fails to make any impression on the minds of the audiences. The ineptness of director Aparnaa Singh is the primary reason behind the film failing to encash on the strong acting prowess of Naseeruddin Shah and Arshad Warsi, or even justify the concept of environmental terrorism. Making things worse is the sloppy editing of the movie which leaves the audiences stone-sold rather than raising their anger and anguish. 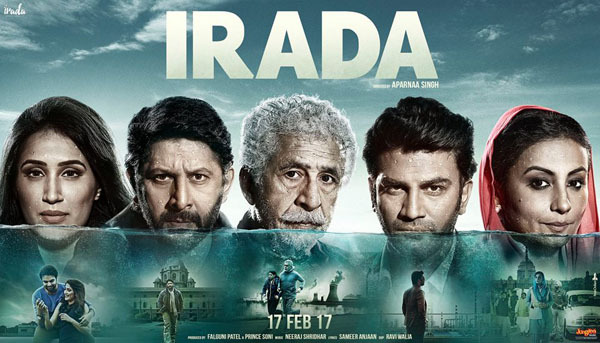 Overall, Irada, despite having its heart in the right place fails to hold the attention of the audiences and IndiaCafe24 gives it a rating of 2.5.